The group name is derived from an ethnic slur, and is an ironic reference to the belief that Japanese rock groups could never be "authentic". Although band activities were ceased starting from January 2001, except for later releases of band material such as compilations and DVDs, The Yellow Monkey actually broke up on July 7, 2004. After this time, Yoshii and Hirose both embarked in other projects. Yoshii started a solo career, in which he called himself "Yoshii Lovinson". In 2006, he would adopt his real, full name. Hirose also went on to form the group "Heesey with Dudes", which is now disbanded. 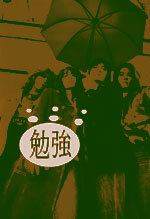 The group also rated #81 in the Top 100 Japanese Pop Artists, by HMV Records Japan. It should also be noted that, as you may imagine, Emma and Annie are brothers. It is the opinion of many of the Mognet staff that The Yellow Monkey represent some of the most unique rock music to ever have come out of Japan. They combine aspects of rock music from the 70s to the 90s, to create their own unique sound. Several of their albums even tell stories in a very theatrical fashion. They were known to put on a similar performance at certain points early in their career, with entire concerts passing in a very somber mood with Yoshii never even stopping to MC at all.